Take care of business, wherever business takes you. Work ON your business, not AT your business. You never know when something will come up. Now you don’t have to be at the office to run on EOS. Traction® Tools texting actions mean peace of mind. You can quickly jot a text to your Level 10 Meeting™ Agenda and move on with your day. Traction Tools texting actions couldn’t be quicker. Just pull up the number from your Contacts List and tap out a short note. Easy peasy! If you’re like most of us, your most important thoughts come when you’re not expecting them. You won’t always be at your computer when you need to capture an Issue, To-Do or People Headline. With Traction Tools software for EOS, all you need is your phone. Text-an-Issue™, Text-a-To-Do™ and Text-a-Headline™ features let you quickly send a text message that automatically adds the item to your Level 10 Meeting™ Agenda. It’ll be there waiting for you at your next meeting! Need to create a personal To-Do, just for yourself? 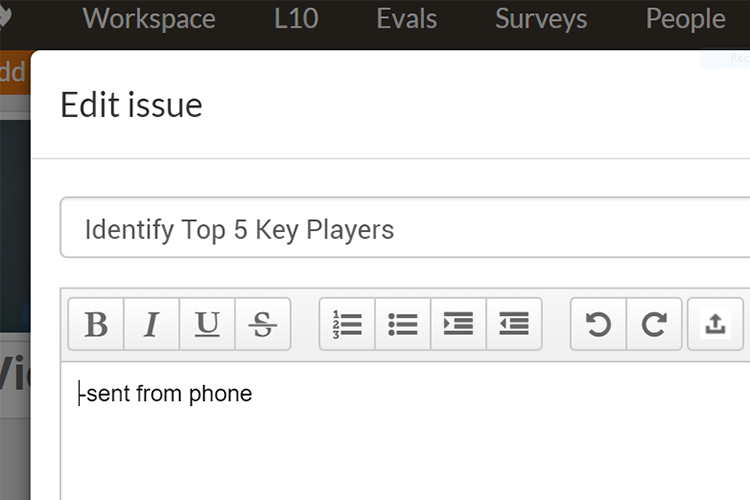 You can also text a To-Do to your own Personal To-Do List and view it in your Traction Workspace™.